On Tuesday 23rd September 13 artists from Kingston Open Arts Studios (KOAS) fly to Oldenburg in north Germany for a group exhibition titled – Art In Transit. 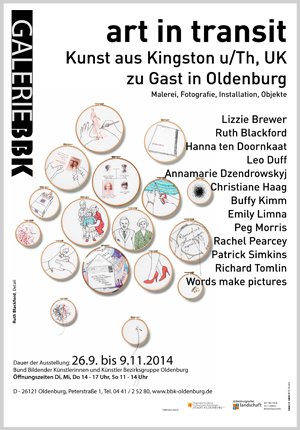 Kingston and Oldenburg are twinned and the two local councils have organised the shows. There will be a reciprocal exhibition in Kingston in December. Much thanks to Hanna ten Doornkaat, the Chair of KOAS for all her hard work getting the exhibition off the ground. It will be my first foreign exhibition…can’t wait.